I hope you all had a wonderful Easter! Let's share a slice of pineapple upside down cake on this pretty day. The blooming pitcher has some Charmelia flowers, which I found at Wal Mart, after reading about them on Mary's blog, Home Is Where The Boat Is. These flowers last a good three weeks, which is a real bargain. 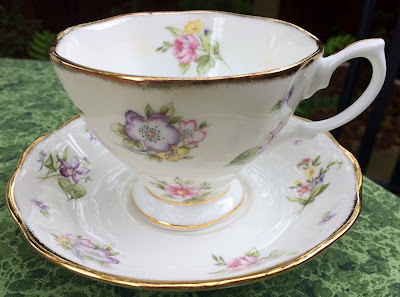 I'm using my reproduction Royal Albert Spring Meadow teacup, which was one of five in a teacup gift from my youngest son and daughter-in-law. My cast iron skillet is smaller than a 12" skillet. I ended up using two mini bundt pans for the extra batter. Heat oven to 350 degrees. Add melted butter to 12-inch cast iron or ovenproof skillet. Sprinkle brown sugar evenly over butter. Arrange 8 pineapple slices in bottom of skillet. Cut remaining slices in half; arrange around inside edge of skillet. Place 1 cherry in center of each whole and half pineapple slice. In large bowl, beat cake mix, pineapple juice, oil and eggs with electric mixer on low speed until moistened; beat 2 minutes on high speed. Pour into skillet over fruit. Bake 40 to 45 minutes or until cake is golden brown and springs back when touched lightly in center. Cool cake in skillet 5 to 10 minutes. Run knife around edge of cake to loosen. Place heatproof plate upside down over skillet; turn plate and skillet over. Remove skillet. Serve cake warm. Look how little Hayden has grown! 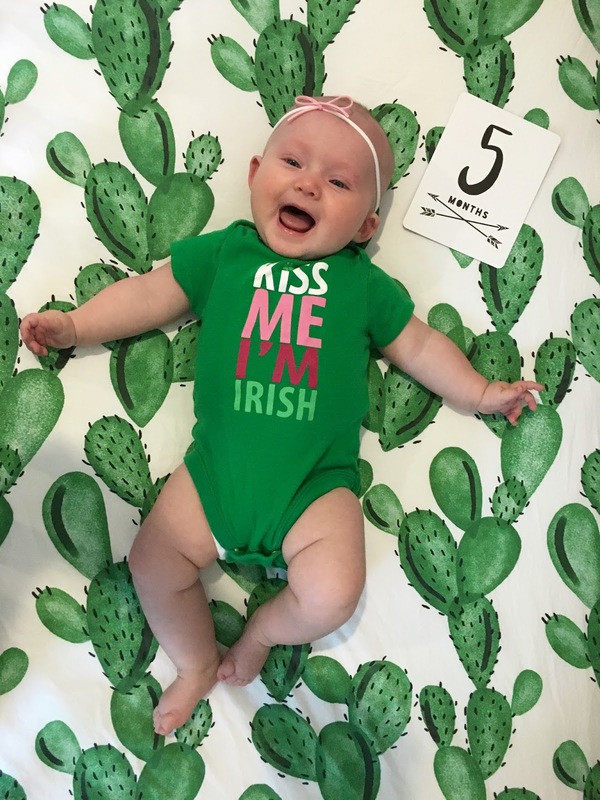 She is the sweetest baby...always smiling, so content, and is the happiest baby. 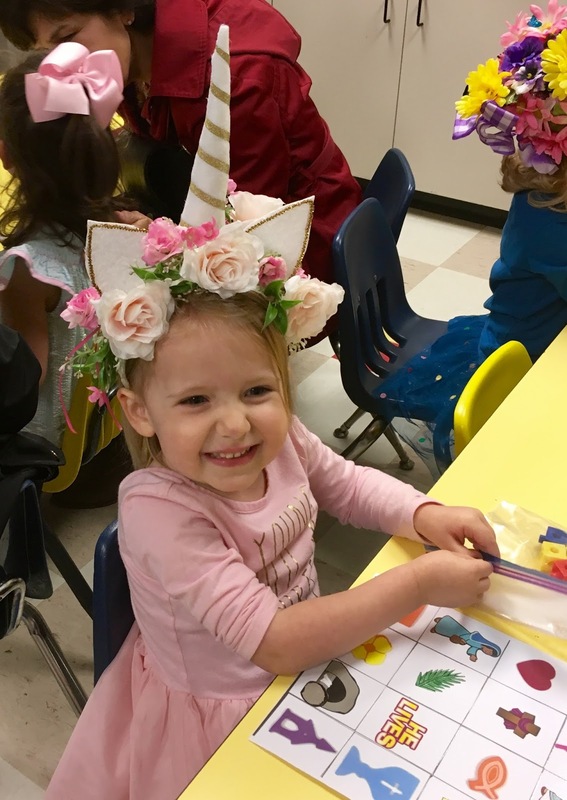 For Harper's Easter bonnet parade at her school, her Mommy made this adorable unicorn hat! Doesn't she look so proud and happy? My son, Tim, dropped his girls off for a few hours to spend some time with me. We managed to make some Bunny Bark, which they were able to package and take home. It was so nice being with these sweet girls. Hello Kitty, the pineapple unsidedown skillet cake looks so good and delicious. Thanks for sharing this recipe at our Cooking and Crafting with J & J! Kitty you have so much fun in the kitchen with your little ones. What a fun idea to make the bark and take it home. They will always treasure their time with their amazingly talented and loving grandma! The cake looks so delish! We had way too many desserts and I tried to give away as much as I could, but had to have cake for breakfast! Hubby did too! I love Pineapple Upside Cake; yours looks delicious, Kitty. The Charmelia flowers are beautiful sitting in that pretty jug. It is always a joy when flowers seem to bloom forever. The little bunny is sweet and your teacup very delicate with those pretty flowers. Your grandchildren are growing fast, aren't they. So many wonderful memories must be made each time they visit. Yes, I had a lovely Easter thank you. May you have a beautiful week, lovely Kitty. There are so many things I heart about this post: your pretty RA teacup; your adorable grandkids; and the tasty pineapple upside down cake and bunny bark! The Easter bunny brought me some teas with chocolate this Easter. Hehehe! Kitty your cake turned out (literally) beautifully. I'll have to keep my eyes open for those Charmelia flowers - so pretty. I love visiting with your grands on the blog. That Haden's adorable, Harper looks so cute in her unicorn hat!, and Tim's girls look quite accomplished and happy in the kitchen too! Have a great week! Sweet family photos - that unicorn hat is a work of art! The cake is gorgeous and I'm sure it was enjoyed by all. Happy new week. Kitty, I have fond memories of pineapple upside down cake because my mother made them often. I haven't had any in years! Your vignette of flowers, cake and the sweet tea cup and bunny is pretty. 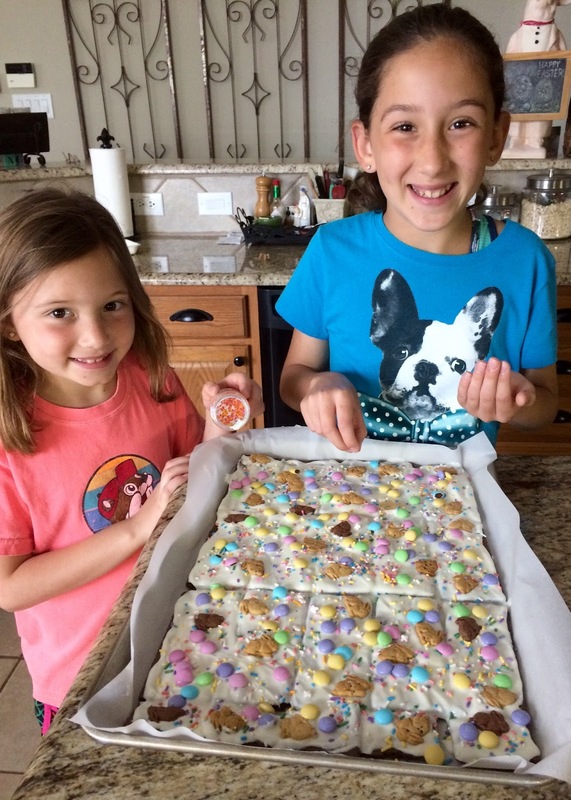 The girls look like they enjoyed making bunny bark. How cute the other girls are, too. More beautiful grandgirlies! You have so many baking partners and sous chefs. 🙂 Hayden has been growing a lot. She seems to be very happy indeed. Hope that your Easter Day was fabulous. Oh boy! That Easter hat is something. So cute. The cake is beautiful and the kids adorable! Love the Easter bonnet on Harper!! How adorable is she?! Great pics and NOW all I can think about is Pineapple Upside Down cake. I see a trip to the grocery store in my near future . . . Such sweet pictures of your grands, Kitty!! Almost as sweet as that lovely Pineapple Upside Down Cake...one of my favorites! I had not heard of "Charmelia" flowers & shall have to look for some to brighten our dreary grey days here in OH. Thinking of your Mom & wishing some warm sunshine for BOTH of us. Adorable Grands and delicious cake!That teacup is marvelous,so delicate!Cute bunny and pretty flowers...What a especial time!Hugs! Kitty, your cake looks gorgeous. I love what all can be done with a skillet (in fact, Thursday morning I'll be posting a skillet recipe). I've never seen that RA pattern - it is really beautiful. I even love the name, Spring Meadow. 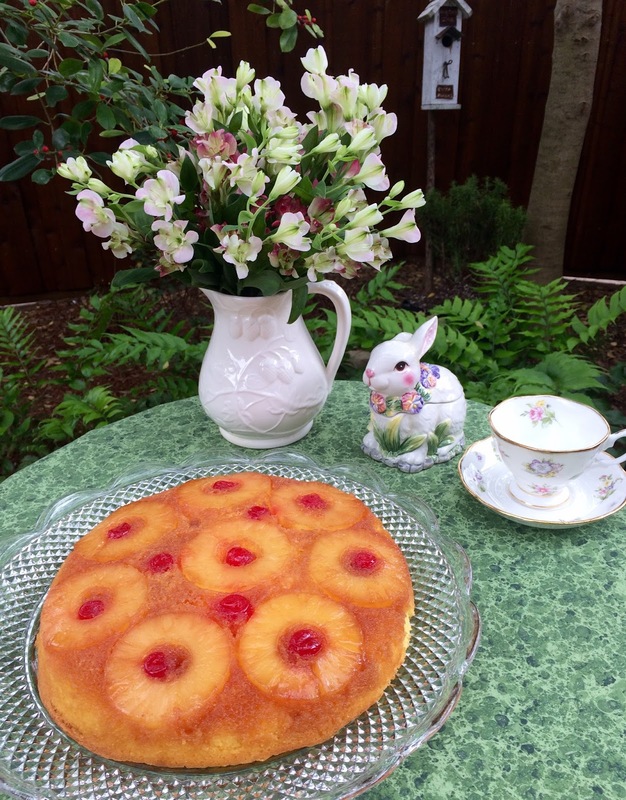 I always love how pineapple upside down cake looks but I am not sure I have ever tried it! Your bunny bark looks so good too. Sweet grandchildren to help in the kitchen and the baby's smile is infectious! How fun to make bunny bark with granddaughters. My son is named Tim also. How I love pineapple upside down cake and yours looks just delicious. Thanks for visiting me today. First - wow does that cake make a gorgeous presentation! It is def. a Show Stopper one, that's for sure, Kitty! YUM! Thanks for the recipe! Secondly, wow - what a gorgeous teacup - and I love that ceramic bunny in the background! Lastly, but not leastly (scaring the grammar police) your grands are adorable! They each have the sweetest smiles, and are beautiful. You must've been in heaven having them with you during such a holy time of year. I sure hope you see lots more of them. The Charmelia flowers are some of favorites, Kitty. They come in so many gorgeous colors too and they are so long-lasting! 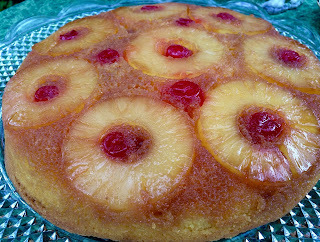 Oh what I would give for a slice of the yummy pineapple upside-down cake! It sure looks like you had a wonderful Easter with those cuties of yours too! Enjoy the rest of your week! Such a beautiful and yummy cake! Love all the decorations/flowers/teacups, etc. So tickled you got some special time with your sweet grands...I'm sure they were very proud to get to take some bark home with them. I just cannot take my eye off from tea cup, that is so beautiful..
Hayden is a doll! Happy sweet smile. Your skillet cake looks so good. The color is so great, mine always turn out a little to brown on the edges, your cake didn't. I must cook it to long. Your girls are so sweet. Always happy to be their Nana. Bunny bark sounds so good! Love your skillet pineapple cake. Such a pretty setting Kitty. I am so sorry your son is fighti9ng nerve pain as well. Have a wonderful weekend. I've got to try this yummy dessert Kitty! Hayden does look so happy. All of your grands are darling!! Thanks for sharing with SYC. Just look at that amazing cake - it turned out so perfectly. I think that should get an award!!! Your grands are always so sweet and that unicorn hat is precious! Thanks for sharing. What a happy post :) I've never seen those flowers here. They are beautiful and any flower that lasts over a week is wonderful! Love your cake and your grands are adorable, Kitty. I love the flowers. I haven't had pineapple upside down cake in years! Thanks for linking up to Keep In Touch. Wow we are finally having some sunshine in our area! Hope you are having a great week and thanks so much for sharing your awesome post with us at Full Plate Thursday!